Shalimar rugs are a new breed of Pakistani rugs, made in contemporary designs and using a blend of Persian and Mughal influences. These extremely fine quality rugs have very high knot counts and very intricate curvilinear patterns. The designs are simple yet very effective and elegant. Shalimar traditional rug weaving originated in Agra, home of the magnificent Taj Mahal. It is here that the Mogul ruler Akbar The Great brought with him a wealth of art, including the art of traditional rug weaving in the 16th century. In order to establish a traditional rug weaving industry in India, he brought Persian weavers with him in 1580 A.D., and thus was born a new and vibrant industry. Traditional rug weaving during Akbar's reign used cotton foundations and wool pile with a color palette of primarily blues and greens on a red base. The designs were interpretations of Persian patterns, but over time Shalimar traditional rug weaving took on a style of its own. Shalimar traditional rug weavers more often work from memory than from a pattern. This spontaneity in creation makes each piece totally original. 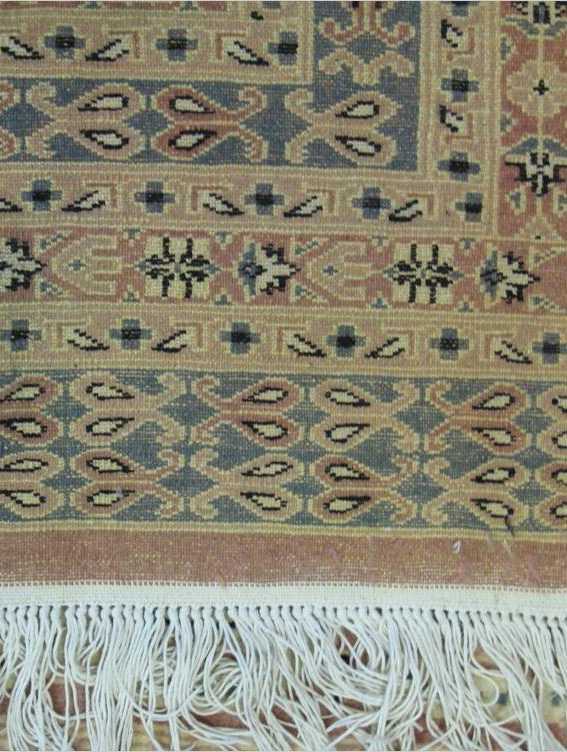 The wool used in a Shalimar traditional rug is hand spun and woven from a blend of choice international wools using the senneh double knot at a density of approximately 80 KPSI (knots per square inch) or using the turkish ghiordes knot. Each Shalimar traditional rug is washed and thoroughly sun dried. Typically the designs on a Shalimar traditional rug are Persian and Mughal influenced and quite varied, featuring vines and floral patterns, animal and bird figures, and geometric and calligraphic patterns. All-over layouts with bold floral borders are particularly striking. A Shalimar traditional rug typically uses modern color palettes that blend beautifully in highly stylized homes. Natural vegetable dyes are used to create warm earth tones, terra cotta, indigo, and black. The foundation on a Shalimar traditional rug is made of a fine count cotton yarn for stability and durability, while the pile is fine quality wool. Although available in a wide range of sizes, the majority of these rugs are mid-size to larger. The sophisticated elegance of a Shalimar traditional rug is equally at home with modern furniture as it is with antiques and will create harmony in any environment. To learn more about pakistani carpets, feel free to visit our pakistani rugs page.